Boy have we got a day for you. It is day 3 and we have several projects to showcase so I will get right to it. Cricut Cartridges Used: Christmas Cheer and Celebrations. 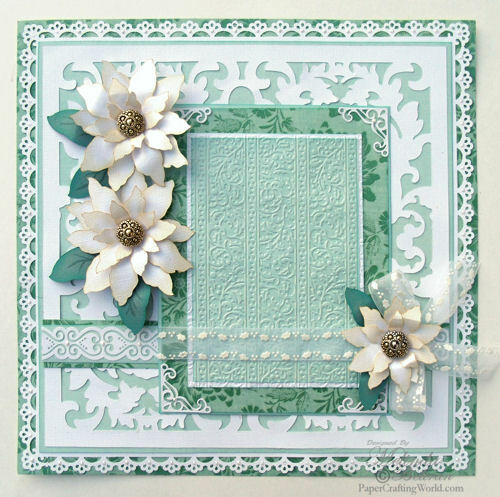 Here is a shot of the flourished baroque paper lace. I cut it at 10.5 x 10.5. I cut this on my Pazzles Inspiration. This is a shot of the patterned paper I used. I cut the inside out so that I could use the inside as a mat. This is a great way to save on paper. When I cut the baroque paper above, I centered it on my cutting mat. I still had the leftover 12 x 12 frame so I just used that and my Martha Stewart Punch set to create the lacey border. Again, a great way to to save on paper. Here is a shot of the "base" of the layout. 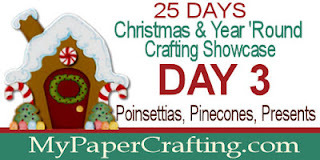 Here is a shot of the paper I used to cut out the Poinsettias. I used Diamond Bazzill Bling. I was trying to show the very pretty shimmer the paper has that you don't see in the regular photos. Here is a closeup of the little pearl accents I put on the border. I used Liquid Pearls for that. Also, I used and EK border punch to create the white border strip. I just punched both sides of the paper to get the look above. In this shot you can also see the Cuttlebug Embossing folder I used for the mat and the photo corners are actually an old cuttlebug die cut. Here is a close up of one of the flowers. I inked the edges with my Gold Dew Drops Ink pad. I like that one because the gold is more of a yellow gold versus other inks that have more of an "antique" colored gold. Here is a shot of the card. I created a tutorial a few years ago showcasing "how" I created this flower. You can go HERE to see the details. The only difference is I used a stamp instead of a die-cut for this one. I used a CTHM stamp and my Blush Ink on Pink (Emma) Bazzill paper. I stamped out 12 "leaves and then cut them out. I wasn't super careful as I was able to ink the edges afterward with a sponge. I also left the paper thicker by the stem. Here is a close up of the flower. I just used a circle punch and layered the leaves in a "cross" pattern. Here is just another shot of the flower. 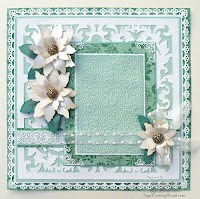 Here is a close up of the sentiment I heat embossed. It comes from the CTMH Merry & Bright Stamp Set. In this shot you can also see the leaves that I stamped with some Sweet Leaf Ink. The paper is so pretty it is embossed with some beautiful black felt so it has a very regal "feel" to it. Here is one final shot of the card. I inked the edges of the patterned paper with some Cashmere Ink and used some tiny pearl embellies from CTHM. The ribbon was some misc. felt ribbon I had in my stash as well as the vintage button. You can also see that I used an EK border punch to create the bottom border for just a little extra detail. Here is a shot of the entire card. 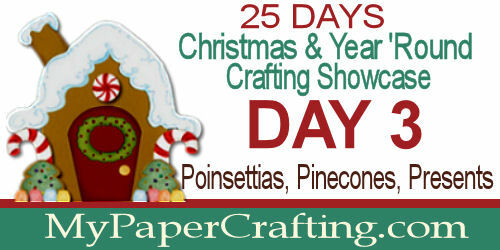 Here’s a close up of the Poinsettia n’ Pinecone Cutting File I used. 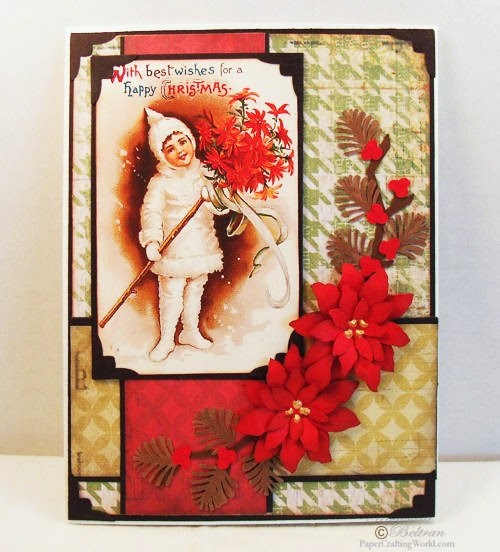 Here is a close up of the little "poinsettias" I created. Be sure to head over to the main blog link and grab today’s freebies. Thank you so much for stopping by. Please take a moment to follow me and to leave a comment. I would love to hear from each and every one of you! Have a wonderfully crafty day!